HammerVPN is an Android app by TunnelGuru VPN that is designed to protect your internet traffic and enhance your privacy by helping you to avoid Deep Packet Inspection. With HammerVPN, your traffic is practically impossible to detect or monitor. It encrypts your data and covers the fact that a VPN is in use. This can be very handy when you are using a network that blocks VPNs. We’ll take a closer look at HammerVPN Anti DPI VPN and the features that it offers. There is not detailed information available regarding the encryption used to protect your data or the way in which the stealth feature works. What we know is that HammerVPN uses its own proprietary VPN that supports a variety of protocols and tunneling technologies. In addition, it uses 128-bit encryption to protect your online data. Although this is not the highest standard of security, it provides good protection in most cases. 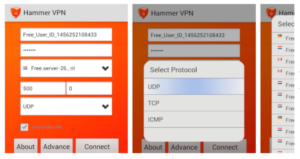 HammerVPN AntiDPI is available on Google Play and you can download it for free. It offers 100 MB of bandwidth and while this is not a high amount, it may be enough for some people who only use VPNs from time to time. If you use VPNs on a regular basis, you will need a higher amount of bandwidth, which is one of the reasons you may want to upgrade to the paid version. In addition, it should be noted that the free version features ads and they can get annoying. To enjoy an ad-free experience with unlimited bandwidth, you can subscribe to TunnelGuru’s service and use the app without restrictions. They offer a monthly plans that costs $4.25 per month. The payment methods accepted include credit cards and PayPal. You can pay through the TunnelGuru website. Before you get a premium account, you can try the free version of HammerVPN, which allows you to use up to 100MB of bandwidth per day. There is also a 3-day money back guarantee for customers who purchase the premium service. In order to get a refund, you need to contact them by email within three days of setting your subscription. A higher level of security thanks to the virtual firewall that protects your device from malware threats. A premium subscription gives you access to the complete set of applications that TunnelGuru offers. You can use all their software to connect to different protocols. As mentioned, when you get a premium account, you get access to additional services that are not included with the free service. Premium users can connect to 1 Gbps servers in Canada, France, Brazil, Mexico, United Kingdom, the Netherlands, the US, Singapore. Turkey, Germany and South Africa. While the number of locations available is limited when compared to other services, the variety of countries and their distribution around the globe, allow customers from any location to find a server that suits their needs. It is important to keep in mind that the HammerVPN servers can’t be used for torrenting and the app is not available in China, Ghana, Syria, Nigeria, India and other countries. HammerVPN is focused on helping users to protect privacy and it is not designed to help users to bypass geo-blocks in order to stream international content. The app is available on Google Play and once you find it, you can simply tap on the Install button and grant the required permissions to complete the installation. Once the process is completed, you can launch the app. You will see the main dashboard and you will see a message letting you know that the VPN cannot be used for P2P/torrenting. You will need to agree to this condition in order to proceed. Then you will see the screen to establish the connection and once you tap OK, you will be able to connect to the server of your choice. When you tap on the down arrow next to the server you have selected on the main dashboard, you will see a list of servers you can connect to using the current protocol. Premium users will see more options and will be able to connect to premium servers in the VPN network. Keep in mind that the selection of servers available will also depend on the protocol you choose. The protocols that you can select are UDP, TCP and ICPM. The first one is the default protocol used by the app and the main option it offers. Since it is the fastest one, it will be the most convenient choice in most cases. However, it is not the most reliable choice when it comes to sending data since it doesn’t verify that the data packets were delivered in the right order or that they were delivered at all. While TCP is slower than UDP, it is more reliable since it verifies that data packets were delivered in the right order. ICPM is designed for connecting rooted devices and in order to use it, access to the super user on your device is required. In the app dashboard, there are other screens that can be accessed. The first one provides information about the Android app and it shows a link to the TunnelGuru, which allows you to set up a paid account and check the Terms of Service. In the second screen, you will be able to access Advanced features. You can assign the DNS used by the VPN and set up a proxy that can be used through the VPN app. Once your premium account is active and you enter your details, you will be able to start using the service. You can start by selecting the server and protocol that you want to use and then tap on “Connect”. In the connected screen, you will see details such as connection time, server you are connected to and outgoing/incoming bandwidth. You will also see a Disconnect button to end the connection. You can switch between servers and change the protocol if needed. Overall, the app is easy to use and it only takes a few taps to start or finish a connection. However, you can only use one device at a time. In terms of speed, just like with other VPNs, you can expect some speed loss when you use HammerVPN. This is due to the encryption used to protect the data. However, the premium service is significantly faster than the free one, which is due in part to the fact that more people are using the free VPN servers. Although HammerVPN can offer decent speeds, since the service is not intended for streaming or downloading content, it is not the fastest solution you can get. HammerVPN offers support via email and while the responses can take a couple of days in some cases, they provide helpful information. They also have social media profiles that can be used to reach out to the support team, although they don’t seem to be very active so it is advisable to use email to contact them. There are some video tutorials available that can help you with the setting up process, but we’d like to see a FAQ section and other resources that can be helpful for new users.